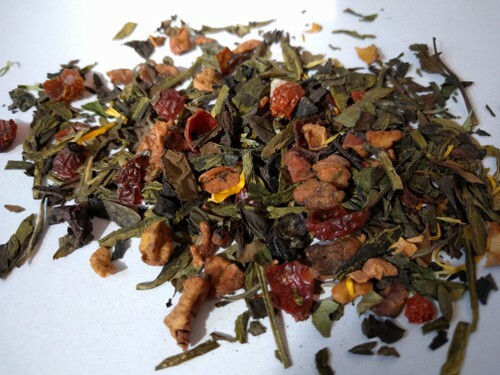 Ingredients: Chinese white tea, chinese oolong tea, dried apples, rosehips, papayabits, sunflower petals. Taste: bouquet of orchids, vanilla and excotic fruits. Features&recomendation with food: Light and delicate tea. Goes well after heavy meal, but can be served with fruits, salty snacks or biscuits. Product highligths: Original blend of two delicious tea – white Shou Mei and semi fermented Tieguanyin. Both teas are from same provice – Fujian. However, white tea has been plucked from special tea bush variety – Da Bai or Great White. Tieguanyin is one of most famous oolong worldwide, due to it’s neat appereance and outstanding quality of aroma and taste!